The Good news for Golden State Warriors fans is that Steph Curry will return on Saturday vs the Detroit Pistons. Curry has missed the last 10 games due to a strained left groin. Curry said, “I’m itching to get back”. Trinity High School in Louisville canceled classes Thursday when a crazy Louisville fan tweeted he would burn down the high school because Jeff Brohm decided to remain the head football coach at Purdue instead of accepting an offer to coach at the University of Louisville. Brohm attended Trinity before heading to the University of Louisville. The tweet (which has since been taken down) said, “If Jeff Brohm doesn’t come, we burn down Trinity,” and “If you see a man running down frankfort with a gas can and wild look in his eye, its me.” According to a radio station, the person posting was a prankster, but the high school isn’t taking any chances. The World Chess Championship began in London on November 9th and after three weeks with 12 straight draws (and ultimately a series of sudden death tiebreakers), Norway’s Magnus Carlsen retained the championship with a victory over the United States’ Fabiano Caruana. The world championship dates back to the 1800s, and this year marks the first time that regulation play ended with a draw in each game. Even though some games lasted for 7 hours, the chess championship was not without its share of drama. 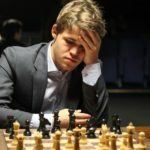 Caruana’s chess preparations were leaked out and Carlsen suffered a black eye (from playing soccer between matches not from sitting over a chessboard for hours :)).